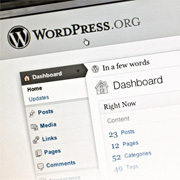 Of all the content management systems (CMSs) being used today, WordPress undoubtedly is the most popular solution. Apart from a diversity of plugins and themes, WordPress offers a highly intuitive dashboard that can be used by webmasters to create impressive looking and functional websites. What started as a blogging platform in 2003 has grown to power more than 75 million websites across the globe. As an open source platform, WordPress is continuously fed by creative ideas, gorgeous themes, enhanced security updates and much more by an energetic community. If you are looking to come up with a good looking, highly functional, well secured, and cost-effective website, WordPress is an ideal solution for your requirements. At Outsource2india, we are experts at WordPress development. As active members of the WordPress community, our programmers, designers, and enthusiasts have been continuously contributing to the success of this venerable CMS platform. With an in-depth knowledge of every aspect of the platform, our developers have laid the groundwork for success for global online brands using WordPress. As a result, we have been able to position ourselves as a leader in WordPress development Staffing solutions. The WordPress developers at Outsource2india are highly passionate about their job. They love to take on challenges and create solutions that help our clients reach the heights of online success. Each member of our WordPress Development and Staffing team comes with special skills, industry experience and knowledge. We like to keep ourselves updated to the constantly changing domains of technology. WordPress, being an open source platform, gets regular contributions that can be used by developers and webmasters across the globe. We intend to seize this opportunity and present our client with the most effective solutions. Though WordPress presents ready to use themes and designs to create a website, customization and personalization is the key to building an identity. Our programmers will help you create a WordPress website from the ground up, replete with all the latest features, as per your requirements. Our immaculate WordPress programming also ensures that you get a highly secure platform to operate online. With the help of an experienced team consisting of UI/UX designers and programmers, we will be able to come up with impressive themes and layouts that match your specific requirements. Our work is not just about being creative but also being highly practical and classy. Without the right type of content, a website fails to attain its goal. Our content management developers not only focus on making your website SEO-ready, but also ensure that they always rank highly in search engine results. Why Hire WordPress Developers from Outsource2india? At O2I, 100% customer satisfaction is our motto. With the help of our high-quality IT staffing services, we have helped global organizations with both WordPress development services and standard web development services. Our WordPress developers for hire will not only ensure that your project completes on time and within budget, but also provide maintenance and regular updates as per your requirement. Whatever your IT staffing requirement - be it LAMP, Java, Drupal, or other similar open source CMS development, you are at the right place. Contact us to let us know about your requirements, and benefit from our cost-effective and customized solutions!